Unforgiving - A Northern Hymn has been greenlit!! The entire team is incredibly happy right now! This means that there is no more doubt... We will start the development of the full game! Thank you so much to every single one who supported us! Everyone on Youtube and every streamer that played and spread our game, every single one of you who voted on our greenlight and everyone who sent us messages with feedback and words of encouragement! We will set up our steam page in the beginning of next week and start the full development of the game as soon as we possibly can! You can keep up with future progress through our website, our various social medias and our steam page! Unforgiving – A Northern Hymn is a first person survival horror game for PC. The end release of Unforgiving is expected at Q4 – 2017. .. Or if you just want to take a quick look. The early gameplay is played in full on the link below. Finding yourself in the deep Swedish woods, a box of matches is the only thing that can offer some comfort from the darkness. Find your way through the Swedish woods by using a match as your main source of light and avoid the horrors from the Swedish folklore. Unforgiving is heavily inspired by the vicious creatures from the swedish folklore and magic from Nordic shamanism. The End goal of unforgiving will include 6 hours of gameplay divided on four different areas that each have a unique environments and gameplay. In the Swedish Woods, you can use a match to light your way. In the military bunker, you will find a headlamp instead. In the Swedish mountains, you have lost the headlamp and are now forced to face the darkness without any help. In the "other side", you can summon a magical guide to show you the path. All of these environments will be populated with distorted and disfigured creatures from the Swedish folklore, which a few you can see in the already existing alpha game (link above). Angry Demon Studio is a team of 5 students, studying game development in our third year. During a school project, we were the lead developers of Creaky Stairs, a group of students that created the survival horror game: Notes of Obsession. We want to continue creating horror games because this is something that we love. What creatures will there be in the full game? @kamyk It says the release date is Quarter 4 2017, so hopefully we see the full release soon! Saw it on gamejolt, then watched it on youtube. great story, looks great ,,, can not wait for this. I see a Youtuber (EletronicDesire) making a video about this game (Playing the Alpha) and I am very excited about this it!!! Looking forward to this from what I've seen it looks promising. Unforgiving - A Northern Hymn has been Greenlit and is now listed in the Steam store. 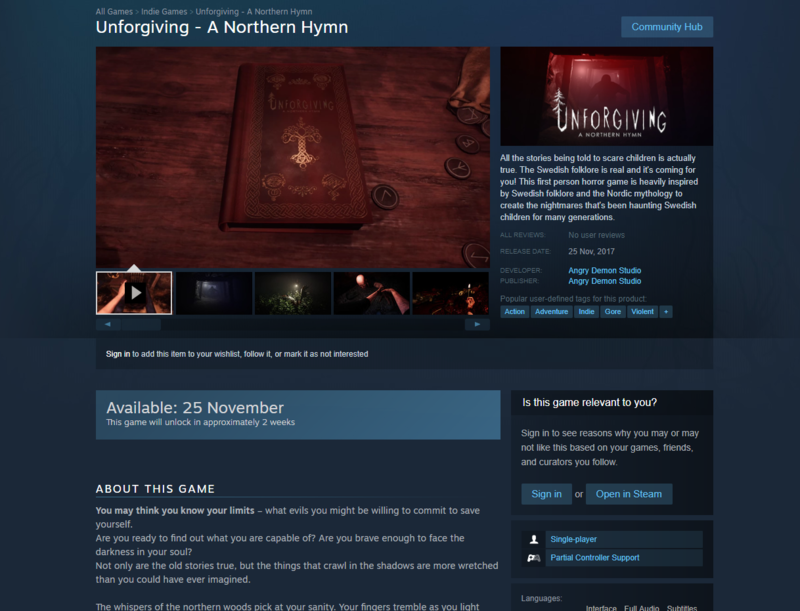 For the latest information, purchase options, and discussions for Unforgiving - A Northern Hymn, please see it on the Steam Store or in the Steam Community.